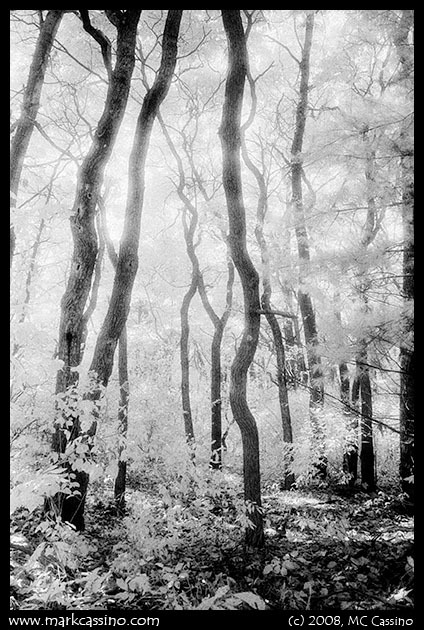 With a few days of sunshine last week I finally got around to shooting out the last frames on a roll of Kodak High Speed Infrared, which had been languishing in the camera for a few months. The sun may have been shining but the ground was still snow covered - and guess what? Bare trees and snow covered ground don’t lend themselves to that infrared look. Oh well - some of the shots from October were interesting. I like this patch of trees - it is along a dirt road by a pull off where I frequently stop to chase dragonflies. Many a time when I’ve walked back to the car I’ve felt a yearning to just wander off into these little twisted trees, which seem to go on forever.